Description: 537 is fresh in off of an Office Car Special down in Oklahoma. Description: Looking pretty nice, the B-LAUWSP leaves the BNSF North La Crosse yard for Chicago. Description: B-LAUWSP4 hauling empty trailers back to Willow Springs. Description: A meet in Barstow. 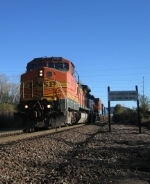 Description: Leading a short BNSF transfer into the BNSF Barstow yard. Most of the cars will eventually end up in the ICE Nahant Yard in Davenport, IA. Description: Im getting bored of seeing the L-CHI101 always running with Dash 8s. Description: The east local heads through Prairie with a short train load. Description: BNSF 537 and 547 haul the La Crosse West Local into Pepin, WI. Description: I really wish these dash 8s would go somewhere far away. Somewhere about 1 million miles away. Description: The east local zips by the Lock and Dam with a nice wave extra. Description: LCHI 102 roars thru the forest preserve at Burr Ridge IL.